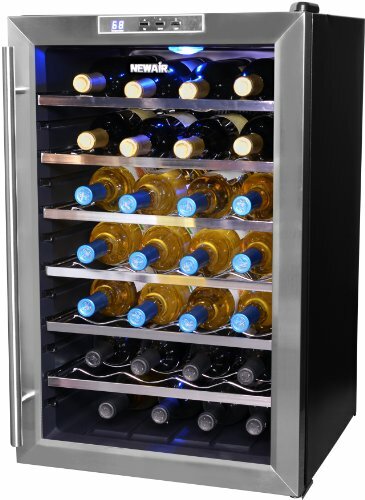 Electric Wine Cooler Refrigerators-Do You Need One? You can cool wine to drinking temperature using a non-electric wine cooler: filling up a bucket with ice and a palcing a bottle in it to chill is very simple. One disadvantage of this no-frill chilling method is that there’s no thermostat to tell you when the wine reached the required temperature. It’s also a bit messy when all the ice melts and you have to wipe the dripping bottle. Another option is to chill wine in the fridge together with your food stuff. This is convenient if you open a bottle of wine only occasionally. Traditional fridges however are too cold for storing wines and too dry to keep wooden corks moist. Not to mention all the odors of the food stuff you keep in the fridge. If you keep wine in the fridge for a longer period of time the wooden cork can dry out and shrink letting in the surrounding air including odors. If you have a few bottles of wine you need a more practical solution to store them at cool temperatures. If you have a few cases of wine and you’re just getting into wine tasting and collecting, investing in an electric wine cooler refrigerator is recommended. By storing your wines at constant temperature, adequate humidity level on canted shelves you’ll provide the best storing conditions that can be achieved without a traditional cellar. 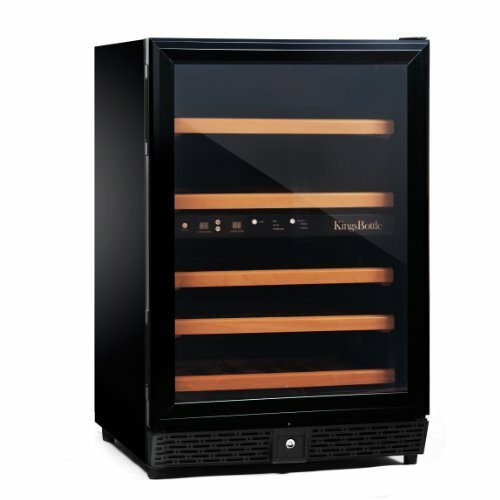 The more advanced, top-quality wine refrigerators like Marvel, Sub-Zero or Franklin-Chef Wine Coolers are designed to maintain constant humidity level of 50-60%. Don’t risk letting your expensive wines going off by keeping them in a hot, dry closet or kitchen. If you’re tight on budget and don’t have much space to place the wine cooler check out some of the 4-bottle, 6-bottle wine coolers or the 12-bottle wine fridges. In the US$ 100 – 300 price range you’ll surely find a good quality nice wine cooler that satisfies your wine storage needs. As your wine collection grows you can buy a larger capacity more advanced wine cellar or wine cabinet and sell your wine cooler you’d outgrown. 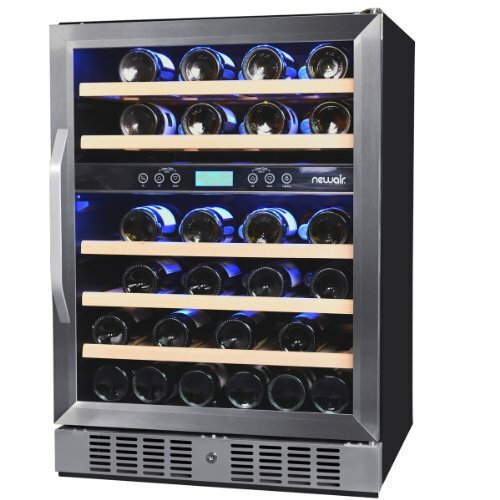 With an electric wine cooler you simply adjust the temperature by pressing the control buttons and wait until the LED display indicates your wine is cooled down to the desired temperature. Besides being practical, electric wine coolers look elegant and they’re a nice addition to any kitchen or dining room furnishing. 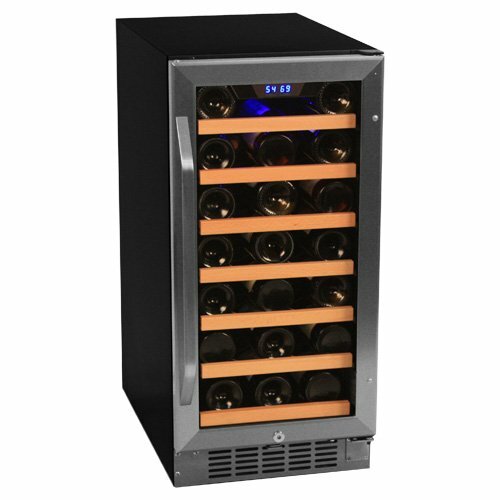 Keep in mind though that electric wine coolers aren’t for long-term storage and aging wines. For these purposes you’ll need a more sophistaced wine cooler cellar designed for maturing wine. 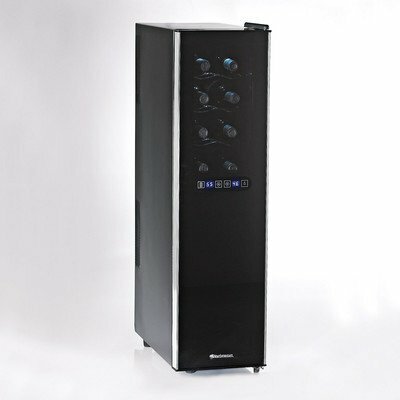 There are many types of electric wine coolers based on capacity, size, decor etc. a Dual- or Multi Temp. zone wine cabinet with two or more distinct compartments with their own temperature controls. Read more on dual temperature zone wine cellars. Which one is the better for your wine storage needs? Thermoelectric appliances are rather new and they’re based on the so-called Peltier effect. Regarding cooling efficiency, traditional compressor-run wine refrigerators perform much better than thermolectric ones. If you like to compare numbers: the cooling efficiency of a compressor fridge is typically around 45%, while a thermoelectric refrigerator’s is only 5-8%. Thermoelectric coolers generate more heat that they have to get drive out from the fridge. This pumping-out uses up a lot of electricity. So be careful when you see thermolectric wine coolers advertised as „energy-efficient”. Thermoelectric wine coolers however do have their benefits about which you can read here. They’re good for cooling smaller number of bottles so if you’re looking for small wine cooler then a thermoelectric one will be a good choice. For the occasional wine lover a single bottle electric wine cooler is an ideal and stylish appliance for quickly chilling wine to the perfect consumption temperature. If you often have guests and friends over a double bottle electric wine chiller is an even better solution. In it you can cool a bottle of red and a bottle of white wine simultaneuosly. Before rushing to get one of these fancy looking electric wine coolers do a thorough research. There are so many manufacturers, brands and models in this expanding market that one gets easily overwhelmed by the wide selection. To narrow down your choices always think through your needs and try to look for wine cooler brands and models that suit your requirements and budget the best. For further tips take a look at our Wine Cooler Buying Guide. The most efficient and time saving way to do this is by reading reviews and ratings of electric wine. coolers. Even better if you compare the most promising wine refrigerator brands and models. Learn from the experience of others who bought and used the appliance for some time. By comparing the different brands and models you uncover all the significant benefits and drawbacks of a certain appliance and you’ll have an all-round and unbiased information that ensures you’ll buy a quality electric wine cooler. Stainless Steel Electric Wine Chillers and Coolers. TIP: This list of the Best Electric Wine Coolers Under $ 500 includes good-value, small-medium size wine refrigerators that got the highest ratings on review sites. You might also want to find more top-rated wine coolers and wine refrigerators. For a compact undercounter wine cooler take a look at our review on the Franklin Chef FWC36 wine refrigerator. If you want to cool not only wines but canned beverages take a look at the GE Monogram Undercounter Beverage Center. If you want something simple and non-electric check out these attractive wine barrel coolers.